Hamilton 16s 21J Gr 992B Open Face US Military WWII Pocket Watch. 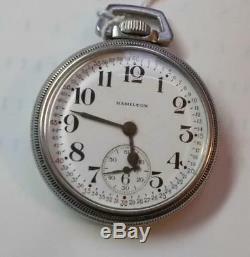 This is a Hamilton 16s 21J grade 992B stem wind and lever set railroad grade open face pocket watch S#C41580. Nice clean movement, marked 992B U. Porcelain single sunk Montgomery dial signed Hamilton looks very good. The watch is in a white base metal screw back and bezel military marked, open face case. The case has had some buffing on the back, however the military markings can be read. Nice railroad grade US Military pocket watch. We have been in the watch business for more than 30 years. We do not attempt to guarantee, accuracy, water resistance, or when the watch was last serviced. We sell vintage watches that we describe to the best of our ability, but remember that these watches may need servicing. The pictures are of the actual item that is for sale. Any defects that are shown in the pictures are part of the description. You are always free to return any watch that is not properly described. Auctiva offers Free Image Hosting and Editing. The item "Hamilton 16s 21J Gr 992B Open Face US Military WWII Pocket Watch" is in sale since Sunday, September 23, 2018. This item is in the category "Jewelry & Watches\Watches, Parts & Accessories\Pocket Watches\Antique". The seller is "alwaysontime" and is located in Owatonna, Minnesota. This item can be shipped worldwide. Model: 992B U S Govt.